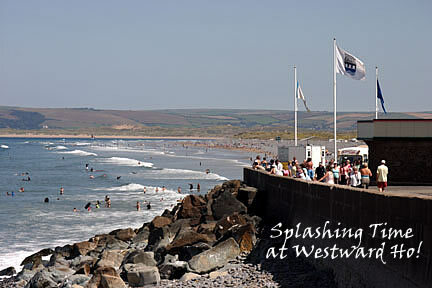 Splashing Time at Westward Ho! We love Westward Ho! and we hope you will too. Westward Ho!, a great British seaside resort on the North Devon Atlantic Heritage Coast has something for everyone, a timeless place where the ancient meets the modern. The ancient being a sunken petrified forest and the famous Royal North Devon Golf Club, the oldest links course in England, situated just over the Pebble Ridge within the Northam Burrows Country Park. Still standing above the resort is the large imposing Victorian building, Kipling Terrace, known previously as the United Services College. It was here that writer Rudyard Kipling spent his schooldays before returning to India. The resort was named after the title of the novel written by another famous literary hero, Charles Kingsley. The panorama has changed somewhat since Victorian times and modern developments have sprung up over the years including the award-winning, wave inspired Nautilus Apartments, one of the first seafront projects to be built here in 2005. Traditional beach huts cling to the edge of the promenade between two more ultra modern luxury apartment blocks which look out over the rock swimming pool across Bideford Bay and beyond. At the end of the promenade you can enjoy the tranquillity and expansive views over to Saunton Sands and Lundy Island from the South West Coast Path at Kipling Tors. Back in the village there are typical British seaside holiday attractions, the delicious aroma of fish and chips and doughnuts, the sing-song sound of the bingo caller and the buzz of the go-kart racing. There are numerous lively pubs, cafes, grocery stores, restaurants, beach shops, amusement arcades, putting green, tennis courts, horse-riding stables and several holiday parks all within walking distance of the sea. The greatest asset of Westward Ho! however, is its fantastic Blue Flag beach. Two miles of golden sands more than enough to accommodate a variety of fun beach and surf activities all year round. In the summertime and on bank holidays, families with young children generally gather by the slipway, easy access for prams, buggies and all that necessary paraphernalia. 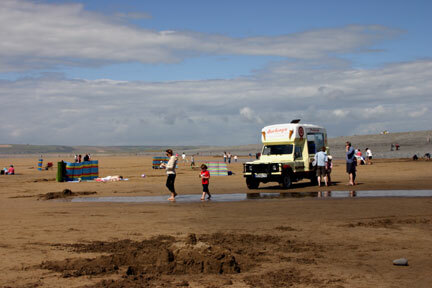 The kids can then explore the rock pools, have a go at body-boarding, build sandcastles, fly kites or play beach cricket. Another good reason is that the Hockings Ice Cream Van parks just above the slipway under the Blue Flags. Further along the beach, depending on the state of the tide, local surf and adventure school instructors put novice surfers or kayakers through their paces whilst down towards Sandymere more accomplished surfers, twist, turn, spill, splash and dash in an effort to catch that elusive perfect wave. Other popular water sports include sea kayaking, skim boarding, kite surfing, and wake-boarding. At low tide the massive expanse of firm sand makes it perfect for kite buggy racing. It is a safe beach and RNLI lifeguards are on patrol in the summer months at the Slipway and also from the Lifeguard Hut by the stone steps at Sandymere. The Bideford, Littleham and Westward Ho! Cricket Club hold regular matches on the pitch situated just beside the slipway car park. It is truly a resort for all seasons, when a walk down the beach, across the Pebble Ridge and around Northam Burrows can be enjoyed in all weathers. Even on winter days, when the wind is so strong it is hard to stand upright locals never tire of the sight of the rolling Atlantic surf. Don't miss the annual Westward Ho! Potwalloping Festival on Whitsun Bank Holiday Weekend.